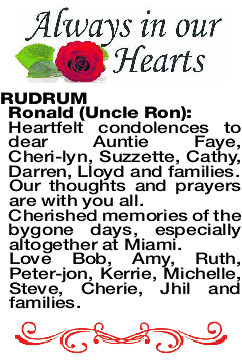 To my dearest loving husband Ron. You've left my heart torn in two. Life will never be the same without you by my side! Until we meet again my love. Thank you for 60 wonderful years of life together! Such a huge hole has been left in our family with the heartbreaking loss of our cherished Dad and adored Poppy. Forever the sunshine of our lives! Your words of wisdom, hilarious quirks, unfaltering love and guidance to your kids and grandkids will never be forgotten. Truly a remarkable, beautiful soul, so sadly missed! The Funeral Cortege for Mr Ronald Rudrum of Dianella will arrive at PINNAROO Valley Memorial Park, Whitfords Ave, Padbury at 2.00pm on FRIDAY (05.04.2019) for a Service in the Cemetery Chapel followed by a Burial Service. 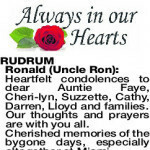 Loving memories of our brother, brother-in-law and uncle. Deepest sympathy to Faye and family. Lorraine, Shane, Donna and Norman (dec). 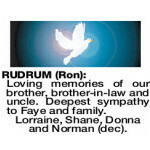 Heartfelt condolences to dear Auntie Faye, Cheri-lyn, Suzzette, Cathy, Darren, Lloyd and families. Cherished memories of the bygone days, especially altogether at Miami. Love Bob, Amy, Ruth, Peter-jon, Kerrie, Michelle, Steve, Cherie, Jhil and families. 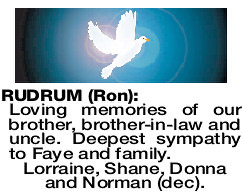 Deepest sympathy to Fay and family from your loving brother Dennis and family. 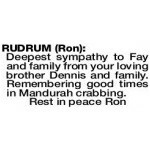 Remembering good times in Mandurah crabbing.